Welcome to the second season of Inventure Academy’s Changemaker Challenge 2018! 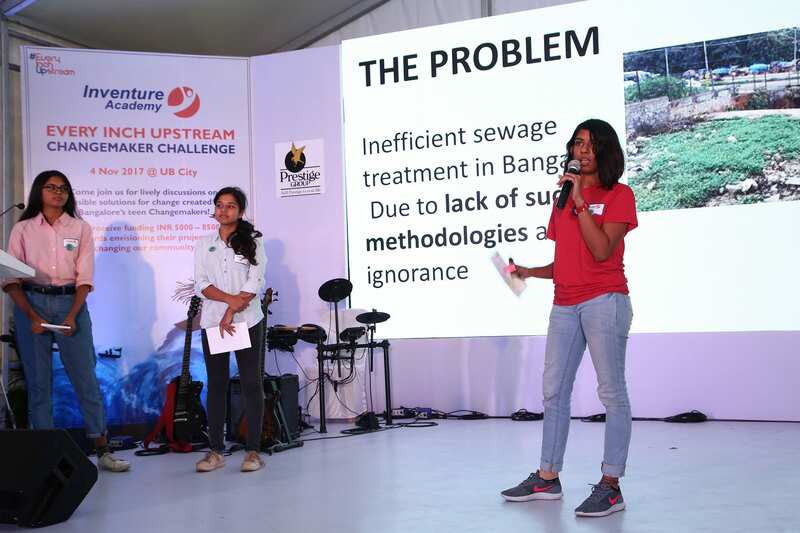 Focussing on categories like Socio economic issues, infrastructural problems, environmental concerns, and personal health and wellbeing, this year’s Changemaker Challenge, has been conceptualised to ensure that today’s youth gains confidence in their abilities and explores socially relevant issues. As part of this challenge we would like students to ideate on these categories. These are just examples that will help you to define the scope of your project within your sphere of influence. You can use these examples to further explore ideas that are relevant in your community. This could be in your school, your neighborhood or even an organisation that you are part of. The average speeds on our roads is already as low as 14 km/h and continues to decline. Incidents of teen depression and their alarming repercussions have shocked many of us. Here are some ideas and questions that may help you form your own teams and develop your ideas. These are just examples that will help you to define the scope of your project within your sphere of influence. You can use these examples to further explore ideas that are relevant in your community. This could be in your school, your neighborhood or even an organisation that you are part of. Can you help skill the next generation of workers by teaching English or Maths or vocational classes in your neighbourhood? Can you start a food bank for pantry items for the poor in your neighbourhood? Can you think of ways to help construction workers in your neighbourhood? Can you help improve the living conditions of the workers living in the temporary “blue tent” housing we see all over Bangalore? The average speeds on our roads is already as low as 14 km/h and continues to decline. Our city’s residents are spending longer and longer commuting. Less than half our city’s sewage is being treated. Water supply from BWSSB is spotty and difficult to predict. Can you think of ways to improve our city’s crumbling infrastructure or help us deal with it? Can you start carpooling clubs? Can you monitor Sewage Treatment Plants in your community? Our lakes have become sewage pits which catch fire and froth. Our air is so polluted that 37% of our students fare in the poor or bad category of lung health screening tests 2. BBMP continues to find it difficult to pick up the 4000 tons of trash we generate daily. What can you do about this? Can you encourage your resident chai wallas and their customers to switch from disposable cups to steel and reusable cups? Can you work with local vendors in your neighbourhood to reduce plastic liners when they serve their food and instead switch to banana leaf liners? Can you implement a waste segregation plan in your neighbourhood? Your school? Can you help monitor air quality in your neighbourhood? Can you find inventive ways to stop trash being burnt? Can you encourage rainwater harvesting and groundwater recharge in your neighbourhood? Can you do anything to take care of stray dogs? Incidents of teen depression and their alarming repercussions have shocked many of us. The government reports that 1 in 5 people in India need counseling – either psychological or psychiatric. According to a recent study 3, ‘Around 65% youth between the age group of 22-25 show early signs of depression’. We are spending longer and longer on our screens and perhaps losing touch with our humanity. What can you do about this? Can you start a youth support group for teens in your neighbourhood/school? Can you start an exercise / free play program for yourself and your friends? A yoga program? Can you share the benefits of yoga with the poor in your neighbourhood? Can you make time spent in the school bus more enjoyable and productive for you and your fellow student commuters? Inventure Academy is among the Top 5 co-ed day schools in India and among the top 3 in Karnataka and Bangalore (Education World C-Fore Survey 2018). It is a not for profit organization established by the India Learning Foundation in 2005 and is affiliated to the Cambridge Assessment International Education (CAIE) and the Council for the Indian School Certificate Examinations (CISCE).